Sodium Ascorbyl Phosphate: A Stable And Effective Form Of Vitamin C? Who said the original is always better? L-Ascorbic Acid is the original form of Vitamin C but it’s irritating as hell. It’s super finicky, too. Use the wrong ph or expose it to light and air and it stops working. Compare that with the copycat, Sodium Ascorbic Phosphate. It does the same job but without throwing so many tantrums. What The Heck Is Sodium Ascorbyl Phosphate? Sodium Ascorbyl Phosphate is a derivative of Vitamin C (L-Ascorbic Acid). When it sinks into your skin, enzymes come along to convert it into L-Ascorbic Acid. I know what you’re thinking. What’s the point of using a derivative if it’s converted to the original anyway? Cos the derivative is a lot more stable (it withstands light and air better) so it’ll still be effective when you finally put it on your skin. And it’s a lot gentler so it won’t make your skin all red as it sinks in. Can Sodium Ascorbyl Phosphate Prevent Premature Aging? Can Sodium Ascorbyl Phosphate Treat Acne, Too? A study published in the International Journal of Cosmetic Science shows that Sodium Ascorbyl Phosphate can treat acne vulgaris. How? Sodium Ascorbyl Phosphate deals with both. 1% of SAP reduces the amount of P.Acnes on your skin, while 5% prevents lipid oxidation in the first place. The scientists said it works a lot better than many other anti acne treatments out there! What Are The Best Products With Sodium Ascorbyl Phosphate? If L-Ascorbic Acid irritates your skin or is too finicky for your taste, switch to Sodium Ascorbyl Phosphate. It fights wrinkles, fades away dark spots and even treats acne without any irritation. Have you ever used products with Sodium Ascorbyl Phosphate? Share your faves in the comments below. Most likely, I have…but never realised it. I really must learn to read ingredients lists!! Xin, oh no! That’s too bad! Thanks for this, it was really helpful! I’ve been wanting to try Vit C products for ages but I’ve heard/read so many things about having to be really careful about the product and how it’s packaged, otherwise it oxidises. Alex, you’re welcome. Most forms of Vitamin C (and all antioxidants in general) should be packaged in opaque tubes and kept away from light, otherwise they lose their efficacy. But SAP is stable so you don’t have to worry about that. Although, I would still go for products packaged in tubes, for hygienic reasons. Hi Gio, is Sodium Ascorbyl Phosphate suitable for dry/ very dry skin? Also, will 20% of it too harsh for first time acid user? Thank you. Wong, the only way to know for sure is to try. 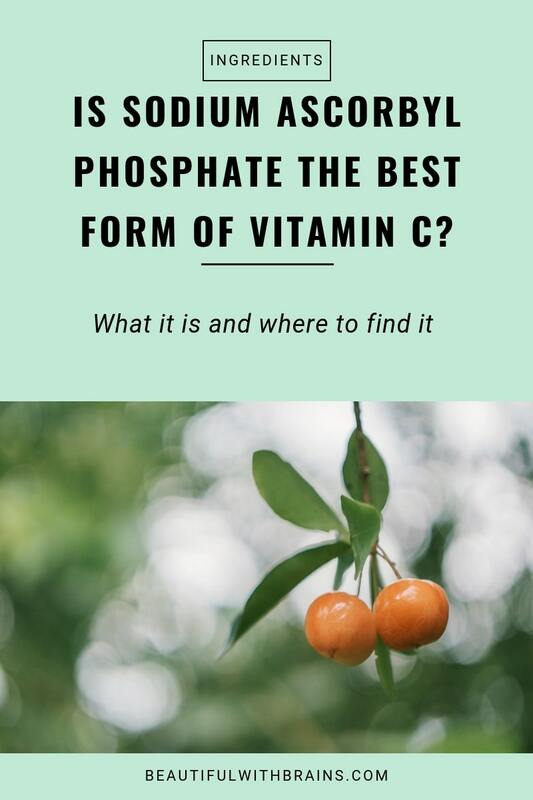 All I can say is that Ascorbic Phosphate is a gentle form of Vitamin C and doesn’t usually irritate skin (unless it’s sensitive). Hi, Wong, I have been using a serum with 18% SAP for over a year now, and I too have dry (… and dehydrated, and sensitive… ) skin, but SAP hasn’t dried it out at all. Hope this helps. I am using the Hyaluronic acid serum from the Tree of life age defending beauty brand and I read that it contains Sodium ascorbyl phosphate, if I use it after the retinol do I still get the full potential of the products or they should be alternated? What do you think about this Hyaluronic acid serum in general? Sodium Ascorbyl Phosphate is a derivate of vitamin C, so the pH isn’t really an issue here. You can use them together. I like that this serum has a few antioxidants, but I’m not a fan of the fragrant oils as they could irritate sensitive skin.